A unique feature of our parliamentary democracy is its free media sustaining the very process, as in the case of periodic elections, nationally for Lok Sabha and state wise for Assemblies. NEWS media, in turn, flourishes from electoral politics. An important indicator of how free and fair our elections are could be seen from the way NEWS media facilitates the electoral process with its coverage. The 16th general (Lok Sabha) elections 2014, could easily be considered a ‘wonder of the world‘, not just for the size, but also for the smoothness with which the 100-day spectacle was held. Since the 2004 elections, NEWS channels, often referred to as the hallmark of poll campaigns, have doubled in numbers and their coverage of elections has become professional and competitive to the extent of determining the process and even in making the very outcome obvious. Hence, the need to look into the trends in NEWS channels covering the poll processes has become critical. CMS has been tracking a couple of prominent NEWS channels for nearly a decade and analyzing their contents. After round the clock monitoring of broadcasts for a couple of years, it was concluded that prime time coverage (7 to 11 PM) is sufficient to reflect the priorities of the day in view of unique nature of NEWS channels, repeat and replay coverage, including the visual footage as often during the day. To bring out the nature of coverage of 2014 Lok Sabha election, CMS analysed the periodic reports of its Media Lab. Five news channels (two English and three Hindi), namely NDTV 24×7, Aajtak, ABP NEWS, Zee NEWS and CNN IBN, were tracked to reflect the scope of coverage of NEWS media in general and of NEWS channels in particular. This monograph presents highlights of this analysis. NEWS media coverage of 2014 poll was unprecedented. Never before has NEWS media coverage of poll campaign been so polarised, (or should we say one directional), to the extent of pre determining the poll outcome. What started as AAP’s Arvind Kejriwal centric media coverage (at the announcement of the poll schedule), became Modi driven too soon and remained that way till the poll campaign ended. Although the fight at the national level was between the incumbent Congress party led UPA and the BJP, the media coverage of Congress party was not even thirty percent at any point of the campaign. Even the coverage of Rahul Gandhi by NEWS channels was only about ten percent of the prime time given to Modi. It was interesting how Kejariwal’s campaign was relegated to a third position as the poll schedule advanced, phase after phase. Government of India’s ministries/department’s are mandated to develop Citizens’/Clients’ Charters (CCC). This exercise, in fact, marks the culmination of a process whose origin can be traced to the Conference of Chief Ministers of States and Union Territories held way back on May 24, 1997, in New Delhi and presided over by the then Prime Minister of India, Shri I.K. Gujral. In this Conference, an ‘Action Plan for Effective and Responsive Government’ at the Centre and State levels was adopted. One of the major decisions taken in the Conference was that Departments would formulate Citizens’ charters starting with those sectors that have large public interface. However, overall not much progress was made in this direction. 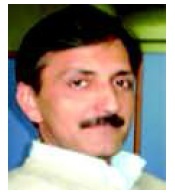 Given the unsatisfactory track record of the implementation of CCC and the uneven quality of CCCs, which were neither useful for measuring the performance of departments with respect to this important aspect of departmental performance, nor was there any consequence for ignoring the commitments listed in CCCs, the High Power Committee on Government Performance, chaired by the then Cabinet Secretary, in its meeting of May 28, 2010 decided to include “Development of Citizens’/Clients’ Charters” in Results Framework Documents (RFDs) as a mandatory indicator for all ministries/ departments. (Table 1). Subsequently, departments have prepared CCCs and all CCCs that were found to be of acceptable quality have been published as a compendium and are also available on the website of Performance Management Division (PMD), Cabinet Secretariat (CS), GoI, which is the nodal agency for ensuring the approval of CCC by respective ministries and departments. CCC of respective ministries and departments are also available on their websites. An independent audit of implementation of CCC under the leadership of Dr. Prajapati Trivedi, Secretary, Performance Management Division, Cabinet Secretariat, was carried out by the Centre for Media Studies (CMS) in mid-2013. Fifty nine (59) ministries/departments of the Central Government, whose CCCs have been approved by PMD were included in this audit. The exercise was intensive which included physical visit to each ministry/department’s office, interacting with nodal officers of 2-3 services provided by the respective ministries/departments, observing the display of CCC, making the phone calls for checking the response rate and accurateness of contact details of the nodal person and analyzing the quality of self-assessment report of each ministry. 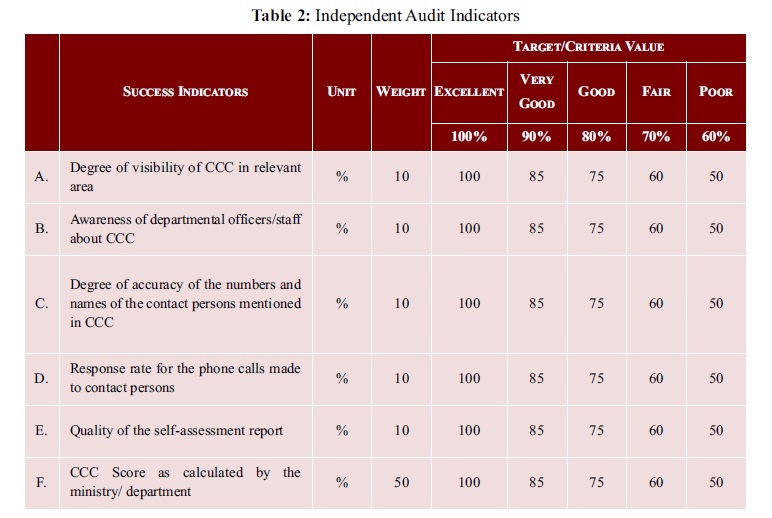 The composite score of the Ministries/Departments on the six success indicators of Independent Audit present a not so satisfactory picture (Table 3). Considering the fact that in case of most of the ministries/departments, the implementation of CCCs has completed about an year or so, the efforts made by departments/officials to make CCC visible is encouraging. At the same time it is observed that CCC is yet to sink in among different level of functionaries functionaries, including the reception desk. Orientation of staff is desirable to give the message that CCC is for bringing both transparency and accountability in service delivery. It is more for self-assessment and improving departments’ performance and less as an additional burden. The perception that ministries/departments do not interact directly with public but has more interdepartmental interaction at centre and as a partner with states, hence there is no need for CCC, has to be addressed for making CCC more effective. Regular, may be every six-month update of designated officials’ name and contact details in CCC uploaded on respective ministries/departments’ websites is desirable. As most of the clients are state departments and institutions, they will be a ‘virtual visitor’ to the ministries/departments through the websites for required information. Last but not the least, this round of audit, due to paucity of time, did not take the feedback of service seekers. Next round of audit should factor in the experience of service users (institution/individuals) as well as assess the implementation of the CCC, in spirit and in action. On the eve of the World Environment Day on June 5, CMS ENVIS Centre has released its report based on a 5 year study of Indian television coverage of environment issues. Over the years, environment has become an extremely grave and sensitive issue not only in our country but across the world. However, Indian news channels, an acclaimed feature of the electronic media, have still not impressively taken up the cause of promoting environmental concerns in the country. In a country like India, media is the most effective environment communication tool, but as per the records, these are not sufficiently exploited for the same and most of the environment stories lack the priority status with which it should be presented. The limited knowledge of reporters also leads to environmental catastrophe, while the stories suffer content limitations, typically providing little qualification or support from scientific data, making vague references to the scientific communication, and emphasizing sensationalist aspect. To bring this concern to the fore, CMS ENVIS Centre undertook regular analysis of environmental issues coverage in six mainstream 24X7 television news channels – DD News, Aaj Tak, CNN IBN, NDTV 24X7, Star News (Now ABP News) and Zee News. The prime time band from 7 to 11 pm was selected for the study. The study, which covered a five year period from 2009 to 2013, reflected on the overall coverage and priorities given to environment related issues by these channels. The year wise analysis of six prominent news channels revealed that the news on politics, sports, entertainment and crime had maximum coverage in five years. Looking at the overall coverage of the channels, it is evident that less than one percent of the total time is devoted to issues like environment and wildlife. In 2009, the coverage on environment was only 1.53% and news on politics was 20.36% (graph given below). In the year 2010, the coverage of sports news was 17.93% in comparison with the environment news 1.29%. Since 2011 to year 2013, the coverage on politics had dominated over other social issues. The coverage on environment news had sharply declined since 2009, which was an alarming situation for environment conservationists. It was found that in the last five years, the media had focused rarely on different environmental issues such as agriculture, weather, natural disaster and wildlife. As the backbone of our survival and consistent maintenance on earth, environment needs to be lent the required space and structure that it rightfully holds. Only then, a mature and palpable interaction will be made possible. Therefore, there is an urgent need to accommodate environment effectively so that the validity of its essence is comprehended and widespread understanding is generated. It is anticipated that the findings of this study would help create an adequate advocacy platform to voice environmental concerns through the electronic media. For more detailed report of this study, please go to ….